A versatile grape variety, being both an excellent quality table wine and wine making variety, Polo Muscat (Vitis vinifera 'Polo Muscat') carries a slight muscat aroma with balanced sweetness and acidity. 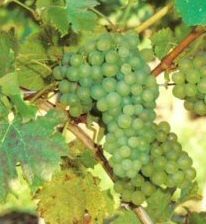 It is noted for its high-yields of early ripening yellow-green coloured grapes. We recommend picking during September.